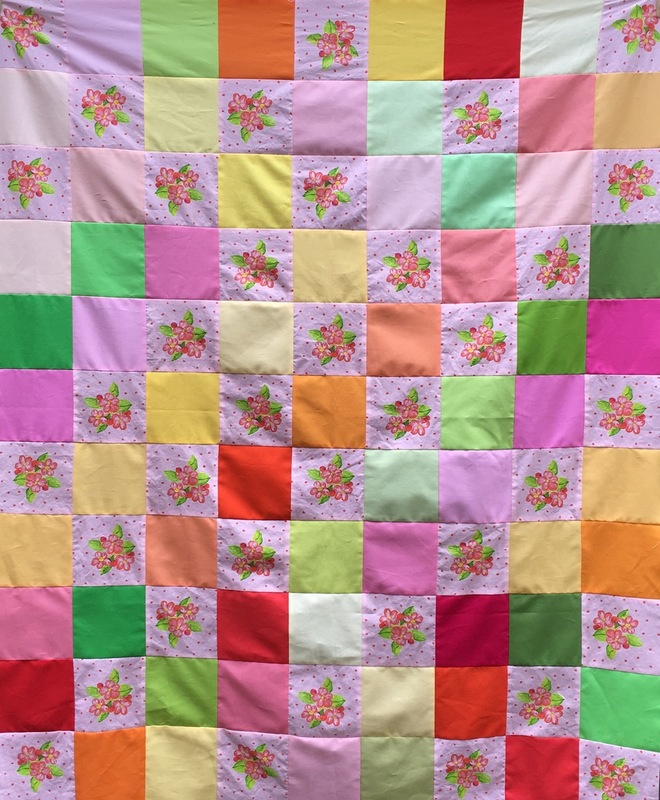 I've been working on my Apple Blossoms Blocks Quilt. The quilt is the product of a printing oops. Apparently my artwork slipped sideways on the art board on my computer screen while I was creating the repeat for the design, leaving a fine white line about the width of a hair on the right hand side. I didn't notice on the art board and couldn't see it on the computer monitor when I up-loaded the design for printing. I've learned to check the pre-print repeats carefully for registration errors, but this one was just too small to see. When I got the printed fabric back from Spoonflower, there it was, a fine white line, less than 1 mm wide, running in parallel lines the length of the fabric. It was barely noticeable, but the eye easily picksup on any break in a design. Sigh. The fabric sat on the table for a while until I decided to rescue the fabric by cutting it up into blocks, avoiding the white lines. I had 2 charm packs of Kona® Cotton Warm Sunrise collection which coordinates perfectly with my apple blossom design. (Note: The Kona® Warm Sunrise charm pack collection is officially "sold out forever", but I found a few still for sale when I did a search last week)! The blocks are a semi-planned random design because I didn't have enough apple blossom fabric to run the blocks in full diagonal lines. I'm planning to fold it at the foot of my bed for a pop of color this summer so the lack of a clear pattern isn't a problem.